What does it mean to clear the clutter? The year is rolling bye just as good as January is gone.I will continue to shed more lights on action steps to making the best of the New Year; you can read the 7 tips for a great new year here. The important tip for today is clearing the clutters. 1. Clear the clutters in your thought life: Everything that goes on in you life starts at the level of your thought life, the quality of your life solely depends on the vibrancy of your thought life, hence the need to start by taking charge of this key area and weeding out any thought that is negative, pessimistic or that saps you of your energy and creativity. Thoughts to watch out for are that of fear, anxiety, rejection, depression filthiness or masturbation, one major not to allow negative thought to linger on in your mind. Spending time in prayer, meditating on God’s Word, reading motivational books, listening to good music and inspirational talks can be very helpful in this regard. 2. Clear the Clutters in your relationship: Life is all about relationships; Friendships, Fellowships, Partnerships, Courtships and more. When it comes to relationships most often than not you are always in charge of who enters and leaves the ‘ship’. On a regular basis, you will need to evaluate the various relationships in your life, define the expectations and responsibilities of the parties in it and also get rid of every negative alliance that kills your dreams or doesn’t help in making you a better person. Burn the bridges on unhealthy relationships that move you farther from God’s plan and purpose for your life. You might also want to look into investing more time in family or spending more of your time with people who you care about and are important to you. 3. Clear the clutter in your finances: This is another vital part of your life, someone once said ‘money makes the world go round’. Allowing disorderliness in your life affects the level of freedom and peace you enjoy per time. 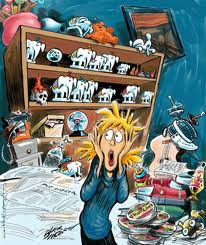 Putting your life in a financial mess reduces your dignity and as a result your confidence and performance level. In fact financial problem is one of the major reasons for divorce and relationship break-ups today. Clearing the clutters as far as your finance is concerned means taking time to keep track of your finances through effective budgeting, offsetting debts and having a proper earning, savings and investment plan worked out. It might be necessary to increase your financial intelligence by reading books on personal finance like Rich Dad, Poor Dad by Robert Kiyosaki, Richest Man in Babylon by George Clanson and other books, you might also need to employ the help of a financial adviser. 4.Clear the clutter in work and career: Here you might need to look inwards into eliminating poor work ethics or habits. You might want to pay attention to your work place or work environment or even clearing out unnecessary Mails or books and lots more. Evaluating projects to see the necessary and unnecessary ones might also help in this regard. 5. Clear the clutter in your health: once again health is wealth: This is where you need to make decisions that will improve your health by a great leap. You might want to set a regular time for visits to the Doctor, or to the gym, rather you might want top take up an health insurance policy or give up any unhealthy habit like smoking or poor eating habits. Whatever decision you make, be certain it makes you a healthier person. I wish you all a happy new month and God’s great blessings!